While visiting Texas for RtW content Brian met up with natives Toby and Augie to try some sushi at Avocado California Roll & Sushi in beautiful Garland, TX. Nestled in an open air mall amid storefronts was a raw fish revelation. Watch as we try multiple different large sushi rolls getting a gander at eel, shrimp, salmon, tuna, and so much more delectable rawness. Enjoy and bring the soy! We venture outside and then into a creepy abandoned house to review some outrageously green Key Lime Creme Soda then to our beloved Crawford Woods to sample some Cracker Jack Chocolate & Caramel Popcorn Nick found in his neighborhood corner store. This video is more fun than a '91 snow day spent home playing Sega Genesis! This blog was designed for me to be able to, not necessarily critique, but give my thoughts on a myriad of things. Being that on this date I’m celebrating my 25th year here on our planet, I thought it fitting, to take a look inward. No, not a review of myself, I’d need years on a psychiatrists’ couch afterwards to pull that off; but, more so a retrospective. 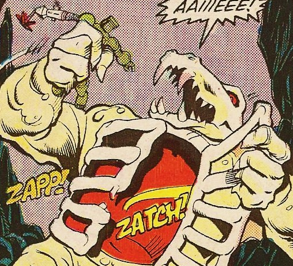 I’ve got to admit, one of the reasons I really like doing this site, is after I write an article on something, be it a food item or toy or whatever, I feel like its been immortalized once it goes online. This idea sort of germinated in my head a few months prior. I wasn’t sure, until about a week ago, if I’d take a crack at it. Even as I write this, it’s all stream of consciousness prose, as I don’t have an actual game plan. I dug through tons of old family photo albums for this piece. That process itself was very rewarding; as I discovered a lot of pictures I hadn’t seen in over a decade. 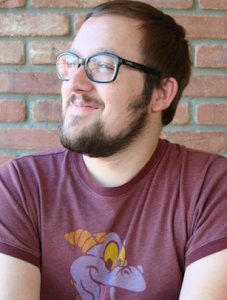 It was hard to narrow down which pictures to use, so I just aimed to use them as a timeline of sorts, and pick ones that made me smile, laugh, or feel nostalgic. I went into a supermarket after midnight last week, sat by myself at a kiosk, and scanned picture after picture in a truly surreal experience. The night cleaning crew occasionally passed by, looking on curiously at the shaggy-haired guy, humming the Fraggle Rock theme song to himself as he worked contentedly. 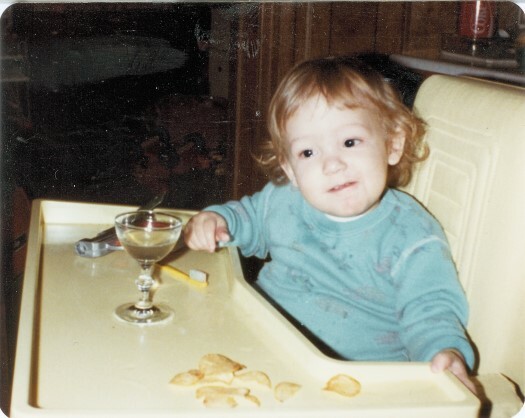 Without further adieu, please join me on a very personal journey through pictures of my first 25 years of life. 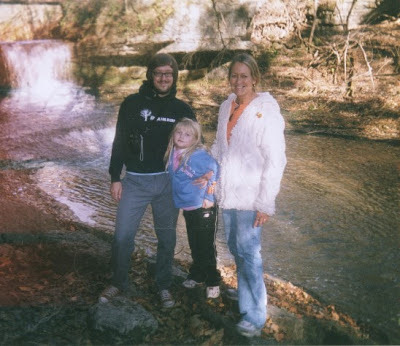 At first, I had dates, and more detailed notes in mind, but I think I just want to talk briefly about each photo, their context, and what they mean to me. I feel very fortunate to have a venue to share so much of myself with you. 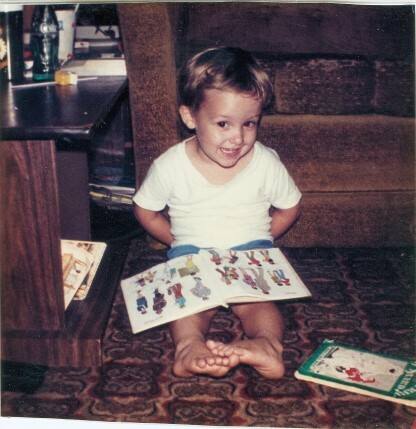 I started off as a little tyke, fun loving, and full of wonder. 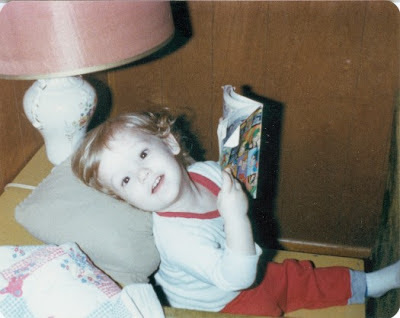 Then that wide-eyed awe turned into energy, and occasionally, mischievousness. 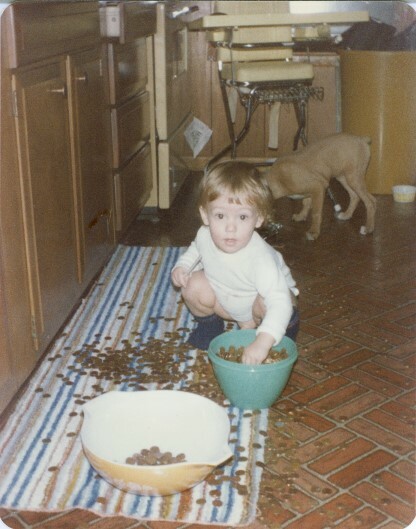 I suppose this was one of my first created games, where I simply moved pennies from one bowl to another. Who needs toys when you’ve got coins? This was one of my very first New Year’s Eves. I was out of control, too, with my combination of potato chips, and tap water in a fancy wine glass. From a very early age, I had a fascination with reading that developed into a full-fledged love as I continued to grow. Here, I’m reading something from DC Comics, as Green Arrow, Batgirl, and Green Lantern are recognizable on the back cover. This picture’s a heartbreaker. It was until at least middle school that I was able to look at this one without crying. I had been in an accident where the tip of one of my fingers was cut off. 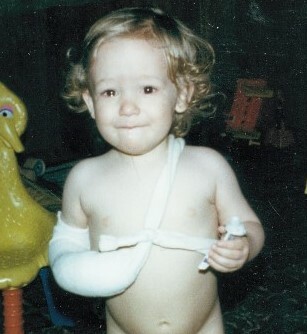 Here I am later that night, back from the hospital, but still a little traumatized. Besides this picture, I still have the scar as a reminder. 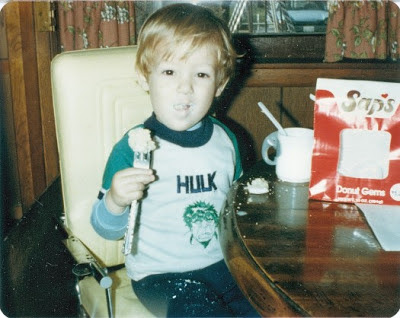 One of my all-time favorite pictures of myself, seen happily munching down on powdered donuts while wearing my beloved Incredible Hulk shirt. Usually I was on the receiving end of being picked on by my older brother Dennis, but here, I’ve got the advantage. Surprise! 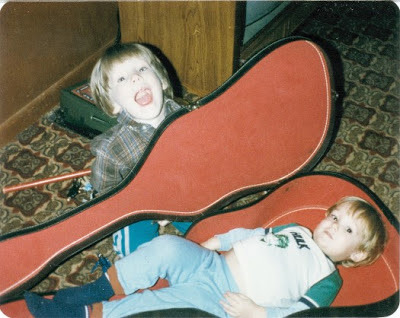 I hid in my dad’s guitar case many times, much to the astonishment of my brother, and I’m glad this peculiar pastime was captured. 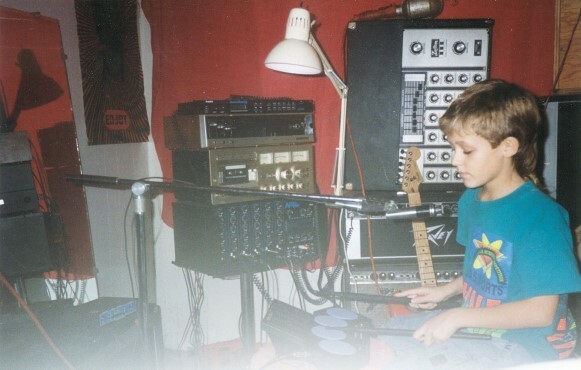 Another thing I liked a lot since a young age was music, and audio in general. 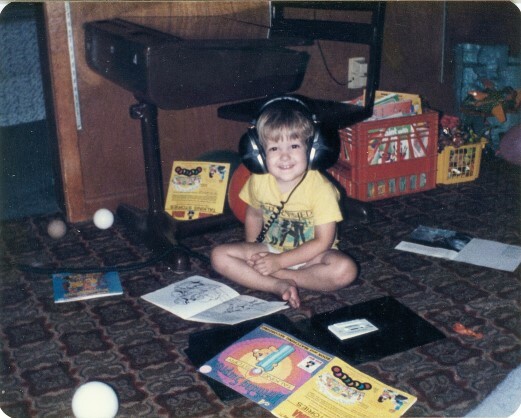 I just loved wearing my parents’ oversized headphones, and would be found many times sitting in the living room before anyone else had woken up, listening to one of my tapes or records. I’ve got to point out the stellar Return of the Jedi shirt, too. All right, I’ll admit it; I just added this one because of its absolutely undeniable cuteness. This picture is so goofy that I can’t believe I had no recollection of it. 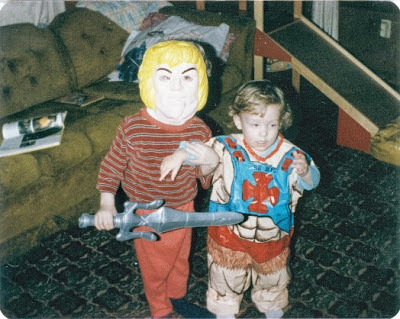 But, there I am, looking inebriated and wearing the majority of a He-Man costume, sans the mask, which strangely enough, my brother is wearing earnestly with accompanying sword and striped sweater. This was on a day where my father took my brother and I to the natural science and history museum in Cincinnati. 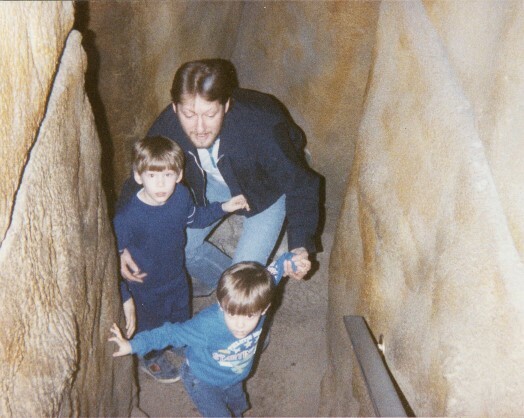 We’re seen crawling through the caverns and caves, which was a blast. To this day, I still adore museums, and am a sucker for exploring. This was our Christmas, of I believe 1987, and another forgotten gem I rediscovered. 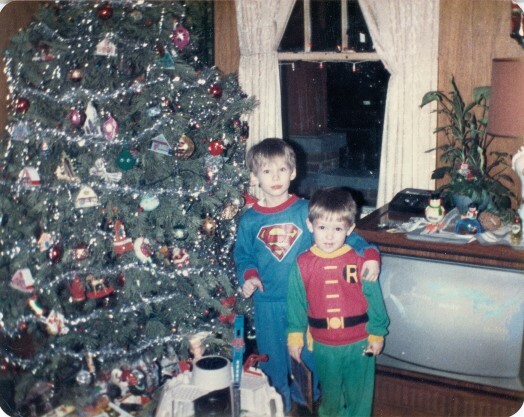 I love our clothes, especially my Robin outfit. Our tree also looks larger and more extraordinary than ever. Like most people my age, I’m still very nostalgic about my Christmas experiences from childhood, and likely always will be. 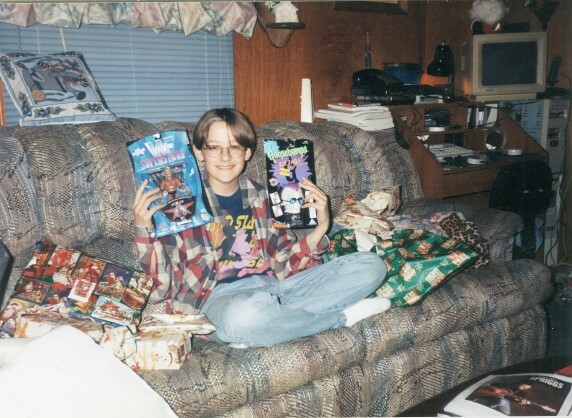 One of my favorite Christmas memories, from three or four years later, was when my brother and I received a Sega Genesis. I remember that night, after my parents went to sleep, we turned off all the lights in the living room, so only the glow from the TV and the blinking Christmas lights illuminated us, and played our first batch of games (Altered Beast, Last Battle, and my favorite Target Earth) until our tired eyes couldn’t take any more. Even though I celebrated my 20th birthday with Chuck E. Cheese, this is proof that we’re old pals and go way back. 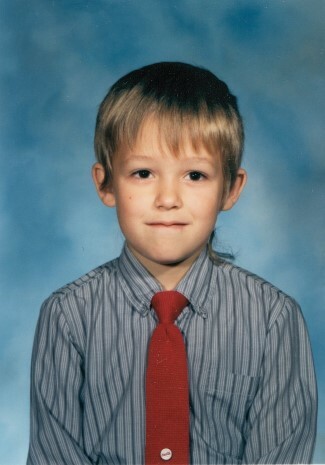 This was one of my very first and least embarrassing school pictures. One year I decided to go as Raphael of the Teenage Mutant Ninja Turtles to a costumed Halloween party. I ended earning the title of best costume, too. 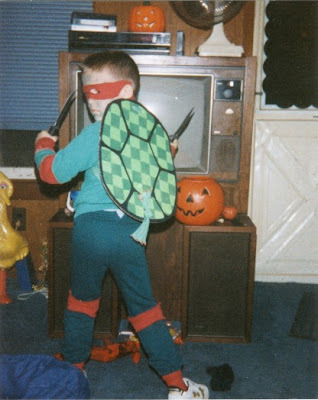 I was super proud of my shell, which my dad made using a pizza box, paint, and a lot of time and care. I didn’t realize until just now, though, that it appears I’m wielding sharp kitchen knives. 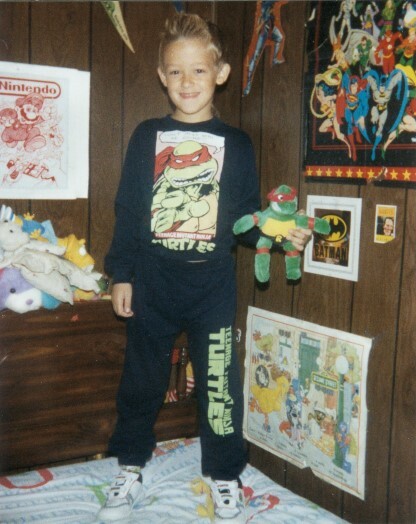 Here I am, I’m guessing circa 1st grade, all adorned in TMNT apparel. You can also get a glimpse of my decorative skills. 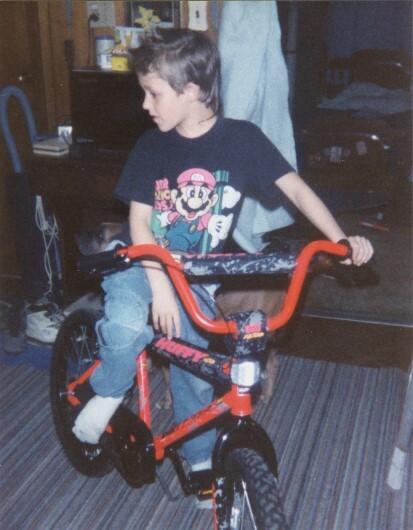 I’d had a bike before, but this was the first bike that was really mine, you know? I’d used old bikes before, but this one, albeit neon orange was bought solely for me, and I cherished it. One summer, my parents put up a really big swimming pool, which played quite a pivotal point in those young years. 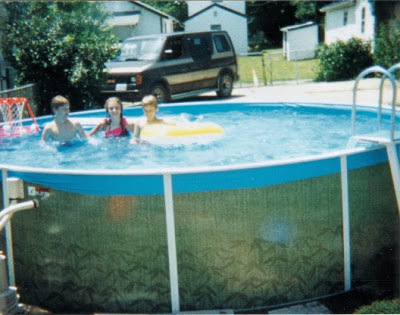 We only had it for a couple years, but, while it was there and usable, it facilitated as not just a recreational tool, but a neighborhood meeting spot, wild whirlpool, wrestling arena, and so much more. 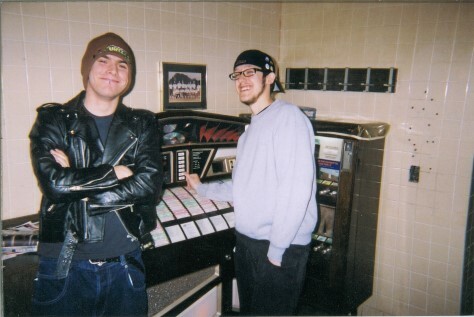 Also featured in this picture besides my brother and I, was a local girl named Jamie, who if for nothing else, will be remembered for being the first person I played “Truth or Dare” with. As mentioned earlier, I’d always enjoyed music since a young age, and at this point, I was especially into rap. I often made my own recordings, pretending that I was a renowned musician, in my imaginary rock band Says, rap posse The Rap Masters, or in my more experimental project, Brian and the Nubian Rain. 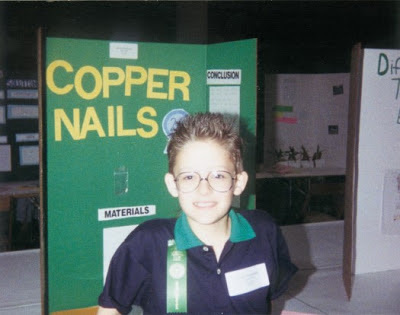 In 6th grade I won first place in my school’s science fair with my project Copper Nails. 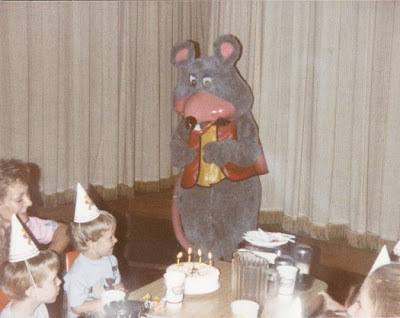 This photo was of me competing in the citywide competition, which I didn’t fare so well in. I can still recall sitting in my classroom, listening to the closing announcements while waiting for the day’s final bell to ring, as they went through the list of the students that did the best, and being shocked when they got to #1 and it was me. 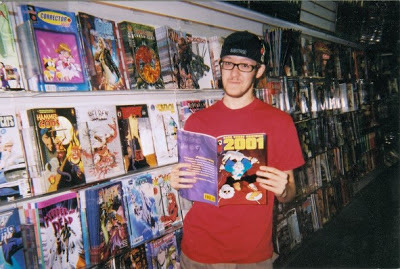 This easily ranks as likely the most embarrassing picture I could have shared. I’m sporting some heinous hair, complete with bleached “tail” and some sort of stripe on the side of my skull. 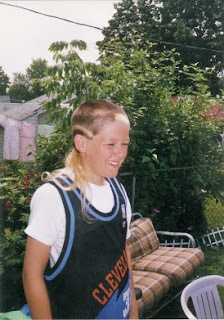 Maybe I should bring that look back. Here I am celebrating Christmas, likely fresh to middle school. My presents are invocative of my interests then, as I proudly hold up a Psycho Sid action figure and some Goosebumps merchandise. 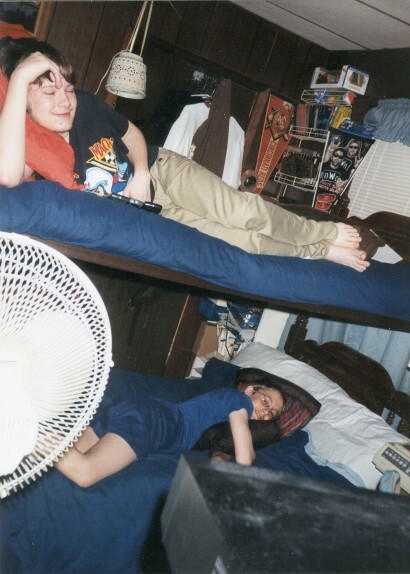 This is a sort of random picture, of my brother and I, escaping the heat of summer in our room circa June ’98. 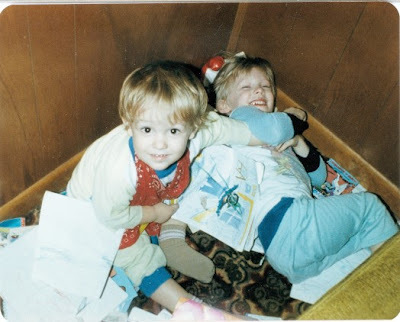 It’s one of the few pictures of us in our bunk beds, and that’s the main reason I included it, as we used those things loyally, and I in fact, still sleep on what was one of the bunks to this day. Here I am around the spring of 2000, nearly graduated from high school. 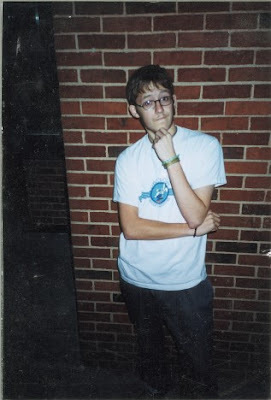 That summer, after graduating, was one of the most exhilarating, exhausting, and rewarding times of my life. This photo was taken in nearby college town Oxford, OH, by then close friend and partner in perversity Chris Davidson. 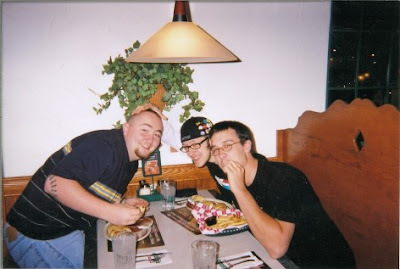 Here I am at LaRosa’s restaurant with friends Jessie Robertson and Steve Smith. Steve was my traveling partner on my adventure to Scotland and Jessie I've known along with his cousins Chris and Daryl since childhood. Here I am with local legend and punk rock purist Eddie Michaels, at one of our old late-night stomping grounds, Waffle House. This large group assembled in my kitchen prior to a New Year’s Eve Party in Indiana. 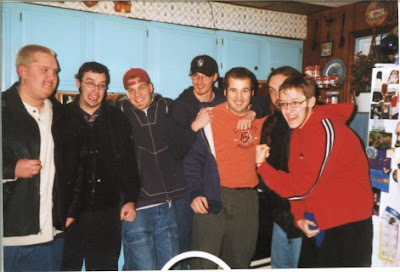 I’ve lost contact and separated from almost all of these guys, but still feel fortunate for having shared time with them back then. Here I am at one of my favorite spots back then, the local comic book shop, where I could wax philosophic about Terri Hatcher’s portrayal of Lois Lane and not seem too weird. Here I am with then girlfriend Molly, about to leave to attend her prom, and my niece, Jade. I dated Molly for over four years, and although we’ve moved on since, I can still look back fondly on the time we shared together. Here I am in 2005 with my fiancé Amanda while attending a cousin of mine’s wedding. 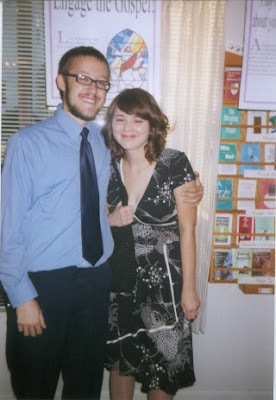 Around the time we started dating, I also reenrolled in college, as well as moved into an apartment with her. It was a busy and challenging period, but also extremely gratifying and fulfilling. Here I am with Jade, and my mom, Bevy Sue. They’re both so important to me. 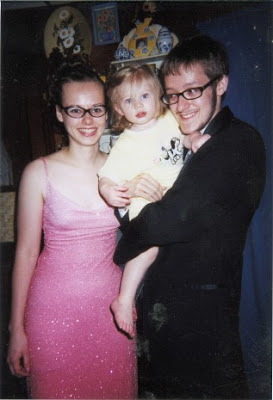 I’ve been around Jade since her birth, and feel I’ve been a very positive influence and figure in her life. My mom is incredibly inspirational. She’s a yoga teacher, practices kindness, loves experiencing new things, and has always been there for me. 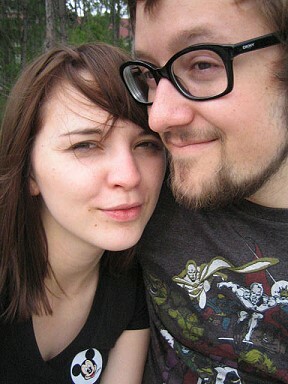 Lastly, I added this, the only non-scanned image, of Amanda and I, from our recent trek to Orlando, Florida. I wanted to end it with an image that, at least to me, is related to who I am now, and who I’ll be in the future. Amanda and I have made a lot of plans for the future, plans I’m incredibly excited and very hopeful about. I look back at these past 25 years and I’ve got to say I’m really happy with how they’ve turned out. Life’s not always been easy for my family, we’ve never had much money, but there’s never been a shortage of love and knowledge nearby. I don’t have all the answers, I’m still searching, like most of us, and that’s totally all right. I was recently told that to love other people, to love your work and schooling, and everything else, you’ve got to first truly love yourself. I can honestly say that I do love myself, the person I was, now am, and will eventually become. Thank you so much for sharing this with me. Part of my Carolina adventure visiting Billy of VeggieMacabre was getting to cameo on an episode of his show Beers With Movie Sauce! Before watching the embedded video I recommend going here to its corresponding entry over on VeggieMacabre as Billy penned a swell introductory piece detailing his discovery of RtW one snowy night long ago. Enjoy! I flew down to North Carolina to hang out with my buddy and fellow blogger Billy of VeggieMacabre! This video is full of clips of my adventure inc. our stops at TEN Park Lanes, HeroesCon in Charlotte, the Reynolda House and Silo Deli Wine and and Cheese Bar, Ted's Famous Kickin' Chicken, Pintxos Pour House, Harris Teeter, and Little Richard's BBQ! I had such a blast and now you can relive this superheroic blogger team-up! This time Brian and the RtW gang hit up a neighborhood frozen treats spot and grill! Right on Pleasant Ave. in Hamilton, OH near the Lindenwald area this small in stature but large in yummy place has all sorts of delicious stuff like malts, shakes, and lots of ice cream treats, as well as food options if you're looking for a bite like local famous Dixie Burgers, chili cheese dogs, chicken tenders, and lots more. We sample the food and take in the street-level ambience in this new RtW vid!